Our product range includes a wide range of weighing scale pallet truck, hydraulic toe jack, hydraulic pallet truck, industrial lift, machine shifting skates and semi electric stacker. Our manufactured and supplied Weighing Scale Pallet Truck are well known in the market for their ergonomic design and high load carrying capacity. With the designing and fabrication being done in accordance with latest industrial norms, these products are highly robust, easy to use and possess effective functionality with maintenance free aspects. In addition to this, widely used in industries and warehouses for carrying cargo, these are offered to customers at competitive market rates. • Easy entry:the fork of our easy entry makes the load of pallets easier. • With its battery charger and its removable battery system.it can operate without a break. • It fits in its steel structure(a good protection ),and allows you to receive data. 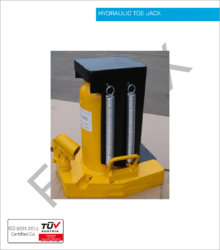 Fabtex manufacture Hydraulic Toe-Jacks are heavy duty, industrial, dual purpose jacks. The design of Toe jack are made considering for low and high clearances this makes Jack ideal for house moving, machinery installation. 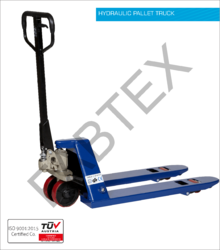 The ‘FABTEX’ range of manual pallet trucks characterized by a robust frame and hydraulic pump, specific wheels and bearings to facilitate sliding are the ideal aid for simple and fast movement in narrow space. The ergonomic handle facilitates maneuvers and ensures safe and comfortable operation; the lifting-lowering-idling operations are facilitated by the lifting pump with three-position lever, which ensures complete control through the operator’s hand. Our mezzanine goods/industrial lifts are designed to solve the materials handling problem of moving and transferring goods from a ground floor to a mezzanine floor. Our flexible design and manufacturing approach allows us to deliver standard, modified or customized mezzanine goods lifts including; load capacity, lift height, power controls, frequency of use to paint finish. Our standard light duty goods/industrial lift has a 250kg of minimum capacity with a fixed platform of 1000mm x 800mm and is up to 4m high running from ground level to a mezzanine floor. The mezzanine floor lift docks 800mm above the floor and benefits from slam shut gates, a hold to run handle at ground level. Lifting and Lowering of Goods only. We are one of the leading manufacturer and supplier of Machine Shifting Skates. We obligated to meet the quality standards as per the customer demand. We are into offering a quality assured assortment of Semi Electric Stacker. 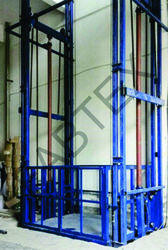 The Semi Electric Stacker we offer is recommended amongst the clients for its safe use. Offered products are known for their availability in committed time frame. Moreover, one can get these products at reasonable rates. 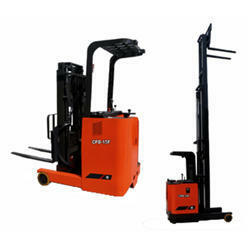 We are presenting a quality assured assortment of Battery Powered Stacker. 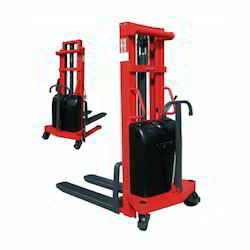 The Battery Powered Stacker we offer is widely demanded amongst the clients for its safe use. Offered products are made by using quality material and thus, we assure our clients that a quality range is delivered from our end. 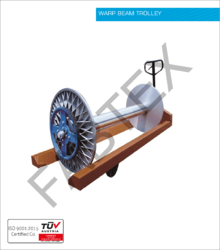 High quality bearings to withestand roll weight upto 3000 kg. Highly efficient wheels to allow smooth transportation around the plant. M. S. Roll of dia 220mm duly cladded with S. S 304 for wet fabric rolling. Trolly is provided with efficient breaking on one side & couping on other side efficient locking system to fix the trolley at desired position. Provision of handle on both sides for moving the trolley. We are engaged in providing superior quality Warp Beam Trolley to our esteemed clients. Keeping a tab on the changing trends and requirements of the customers, we bring forth an exquisite assortment of Single Warp Beam Trolley. Precisely fabricated using superior grade raw material and components, these products are provided with highest level of customization. Suitable for transporting empty as well as full warp beam. Carrying capacity 2000Kgs having beam flange dia up to 1250mm. PU wheels to ensure constant floor contact and stability. The hand operated warp beam lifting trolley is controlled by maintenance free hydraulic hand operated pump with over load protection and lowering by manual operations.